This article will review Fed chair Powell’s latest comments on Fed policy. Powell sung a hawkish tune on November 14th even though CPI showed core inflation decelerated in October. This reminds us that the Fed isn’t data dependent like it says. The Fed is forecast dependent. If the Fed’s models show inflation will increase in the next 12 months, it will raise rates even if the recent data shows the opposite trend. Firstly, it’s important to point out that the fiscal stimulus has played a large role in where the economy is now. The Fed shouldn’t get the credit. The fiscal stimulus allowed the Fed to raise rates 3 times in 2018, with a potential 4th hike coming in December. If there wasn’t a fiscal stimulus, the Fed might be grappling with getting rates far enough away from the zero bound, so they can cut them during the next recession. Housing Isn’t Affordable, So The Fed Hikes Rates? Secondly, Powell being very happy with the economy means he sees more rate hikes coming in the next few quarters. It’s scary for stock investors because the ECRI leading index is at a 139 week low as we documented in a previous article. That’s the textbook definition of hiking rates into an economic slowdown. The chart below visualizes that policy in a different way. It shows the percentage of people saying it’s a good time to buy a house and the Fed funds rate. If the housing market is about to slow because prices aren’t affordable, it could slow the economy which wouldn’t make rate hikes the best policy solution. 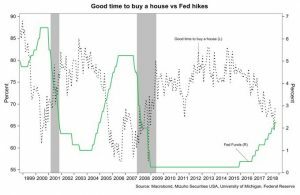 To be clear, this cycle is different from the last one because in the previous cycle many more people had taken out variable rate mortgages which caused monthly payments to increase along with interest rates. Hiking rates still doesn’t help housing even though variable rate mortgages aren’t prevalent. Rising interest rates have helped cause purchase applications for houses in November 2018 to fall to the lowest level since February 2017. Refinancing applications are the lowest since December 2000 as 30 year fixed mortgage rates are at 5.17%, which is the highest since 2010. One point which supports the Fed is that housing rises during expansions. When prices start to rise too much it could signal overheating which rate hikes are aimed to squash. All meetings being live means all meeting can include a rate hike. The December meeting will likely include a hike, but the Fed funds futures market actually expects 1-2 hikes in 2019 which is less than the number in 2018. If there are 2 hikes, that’s nowhere close to every meeting being live as there are 8 meetings per year. That could mean Powell is more hawkish than the market expects the Fed to be. As you can see from the chart below, the spread between the 3 month libor and the 3 month Euribor is 2.93%, the largest since the peak before the dot com bubble burst. The Fed has been raising rates slowly since December 2015 while the ECB is still contemplating its first hike. This dislocation in policy is helping push up the dollar. It’s historically extreme. The other important point Powell made was that he’s not incredibly concerned with weakening global growth. He said the global growth decline is “not a terrible slowdown” as the pace of growth is “gradually chipping away” at estimates. The current slowdown isn’t severe yet, but it’s tough to claim it’s not a big issue since the slowdown isn’t over yet. If the slowdown is in its beginning stages, the U.S. economy will be hurt by it soon. Powell won’t change policy because of this slowdown yet. Let’s look at some of the recent global data points which point to weakness. As you can see from the table below, quarter over quarter German GDP growth was -0.2% which missed estimates for -0.1%. This is the first negative print since Q1 2015. Annualized growth was -0.8% which is a big fall from the 1.8% annualized growth in Q2. 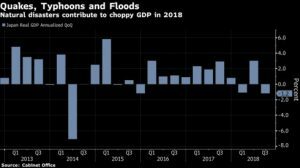 The Bloomberg chart below shows Japanese Q3 GDP growth was -1.2%. This is because of global trade weakness, natural disasters, and weakness in the Chinese economy. Business investment growth was -0.2% which is the worst in 2 years. It fell from 3.1% growth in Q2. Private consumption growth was -0.1%. 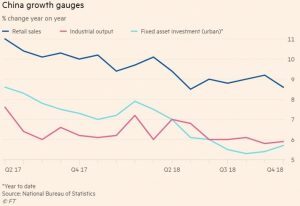 Chinese growth has been in a downswing all year, but there have been some temporary boosts in some parts of the economy in October because firms are pre-buying goods before the US tariffs on Chinese goods increase from 10% to 25% at the start of 2019. This explains why exports and imports rose 15.6% and 21.4% year over year. China is also taxing American goods. Those rates could increase as the trade war ratchets up. The chart below shows year over year growth in Chinese retail sales, industrial output, and fixed asset investment. Retail sales growth was 8.6% which is down from September’s 9.3% growth. Year to date growth fell 0.1% to 9.2% and year to date online sales growth fell 1% to 26.7%. The pre-buying helped fixed asset investment growth and industrial output. Fixed asset investment growth was 5.7% year to date as it has accelerated in the past 2 months. Industrial output was up 5.9% year over year. If the Fed funds rate being above the ECB rate, poor home buying conditions, declining core CPI, and global growth declining won’t stop rate hikes, what will? The Fed needs to see financial conditions become stressed before it halts rate hikes. As you can see from the chart below, banks are increasingly willing to extend credit to consumers which shows financial conditions are still steady. The net percentage of banks stating increased willingness to make consumer loans rose to 14% which is the highest reading since Q4 2017. Powell was hawkish in his latest interview, which signals he may want to raise rates more than the Fed fund futures market suggests. It would be shocking if the Fed decided to add hikes that the futures market didn’t anticipate. That’s probably not ideal as the ECRI leading indicator suggests American economic growth will slow in 2019. 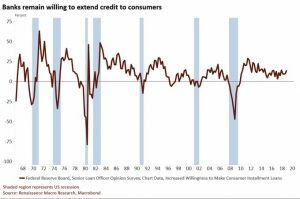 PreviousCan A Positive Yield Curve Signal A Recession?